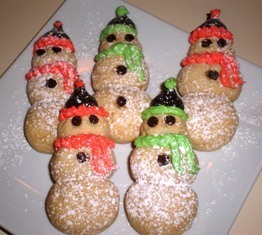 Snowflake Cookies are crisp, buttery cookie that are made using a cookie press. You can make the cookies all white and add white sanding sugar for a snowflake look. You may also add food coloring for a solid or multi-colored effect. In a bowl, combine the butter, cream cheese, and sugar until creamy. Beat in the egg yolk, vanilla, and orange zest. Add the flour, salt, and cinnamon and blend well. 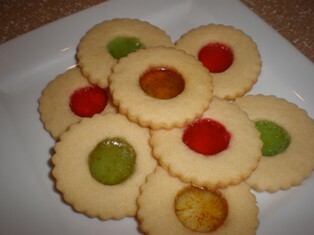 Fill a cookie press with a portion of the dough. Form the cookies on ungreased baking sheets. Add decorative sugar, if desired. Bake 12 to 15 minutes until set but not brown. Transfer cookies to wire racks to cool. Add a few drops of liquid or gel food coloring after the dough is formed. Use a spoon to blend the color into the dough so that it forms a solid color. You can separate the white dough into several pieces and use a different color for each. Fill your cookie press and form the cookies on the baking sheets. Divide your white dough almost in half making one piece slightly larger than the other. The larger piece will remain white. Separate the smaller piece into 2 to 3 pieces. Blend a different food color into each piece. Form a log with the white dough that is slightly smaller than the length and width of the cookie press. 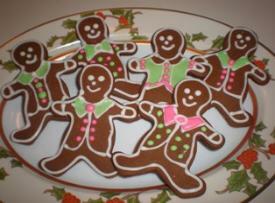 Make strips of the colored dough and place 2 or 3 of them lengthwise onto the white dough. Place the dough log into the cookie press and proceed to form the cookies. 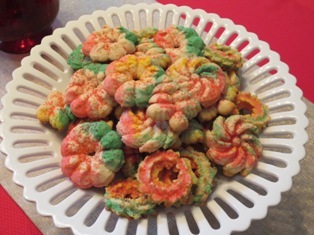 Note: You want a larger portion of white dough to colored each time you fill the cookie press. The white dough prevents the colors from mixing too much and creating muddy colors.